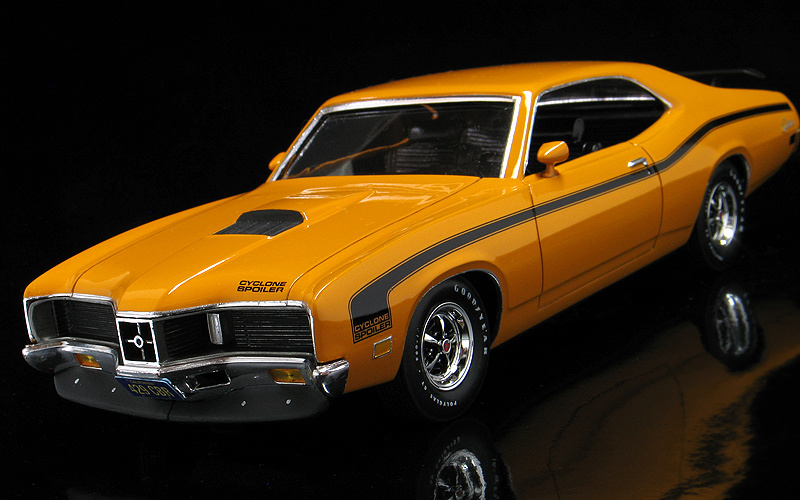 I've always liked the looks of the 1971 Mercury Cyclone Spoiler. It's a huge, aggressive looking car with a preposterous beak at the front. It's from a time when gas was cheap and designers ruled the roost at car companies. They had freedom to create rolling sculptures without fear of the engineers telling them to make it smaller, lighter and more efficient. Every seen under the hood of one of these beasts? There's massive amounts of empty space with no other purpose than to make the outside look low, long and mean. Then emissions testing and the gas crisis of the early '70's came along and spoiled the fun. 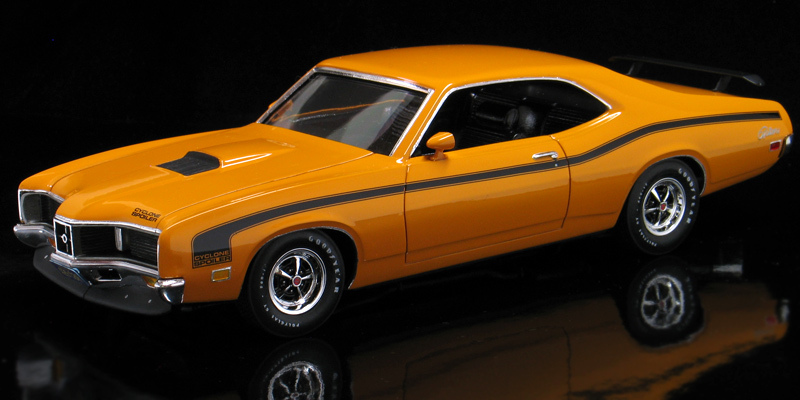 With that, the '71's would be among the last gasp of Mercury muscle. I've wanted to add a stock version of this monster Mercury to my scale model collection for a very long time. MPC released a kit of the car back when they were new in '71. MPC then quickly converted the tooling into the David Pearson NASCAR kit making the original version rare and highly collectible. Somewhere in between these two kits, a Funny Car version also appeared. The Funny Car version had it's hood molded closed but otherwise has a completely stock body. I was lucky enough to obtain one of these funny cars kits a while back. 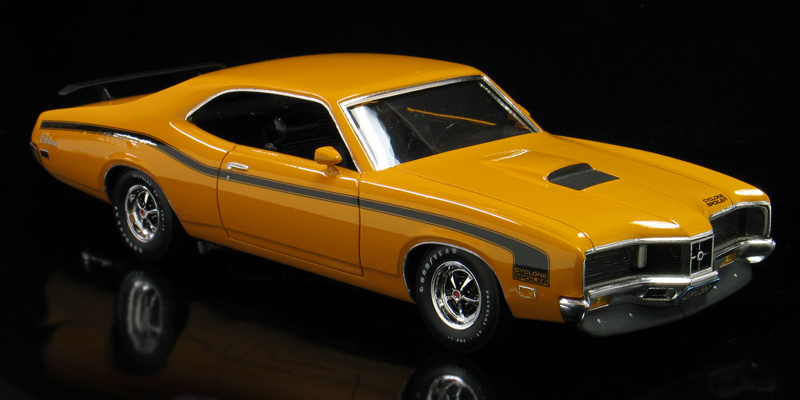 Since the version I got had a nice unpainted stock body, I decided to swap it with a NASCAR body from the recently re-issued Model King '71 Cyclone kit and use the funny car body to build a stock version. I'll eventually get around to building the funny car too but I wanted to build the stock version first. With a stock body in hand, I decided to look for a suitable chassis and interior to complete it. 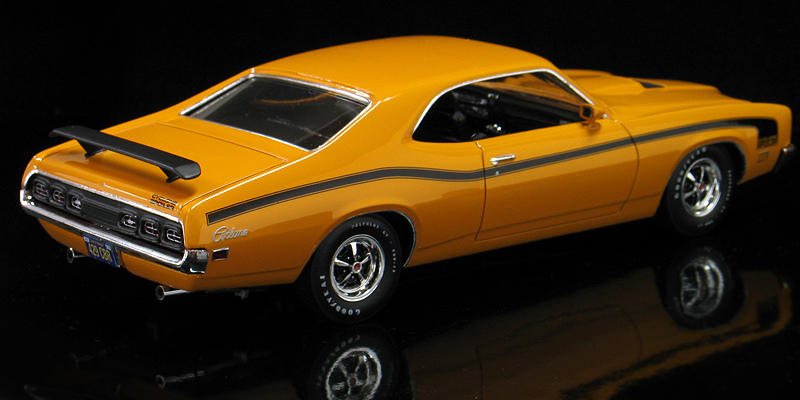 After checking the interior and chassis from a Revell '70 Torino Cobra I was surprised to find that they were almost a drop-in fit with the Cyclone body. While the chassis and big block 429 engine from the Torino are correct for the Cyclone, the interior is not. I tried locating an original MPC Cyclone interior to use for several years but never found one. After studying some photographs I decided the Torino interior was close enough for a self model and decided to go ahead and use those parts. Plus, the Torino interior is very nicely detailed. It needed some minor trimming at the top of the door panels to fit the door profile of the Cyclone but other wise I used it as is. When I designed the box art and decal sheet for the Model King Cyclone stock car kit, I also put all the stock Spoiler graphics on the sheet for both the '70 and the '71 cars. I have several of those kits so I used those decals here. For paint I used Testor's Grabber Orange lacquer followed by a PPG urethane clear coat which is a correct factory color for 1971. Luckily, the Funny Car kit I got had the correct rear wing I needed. 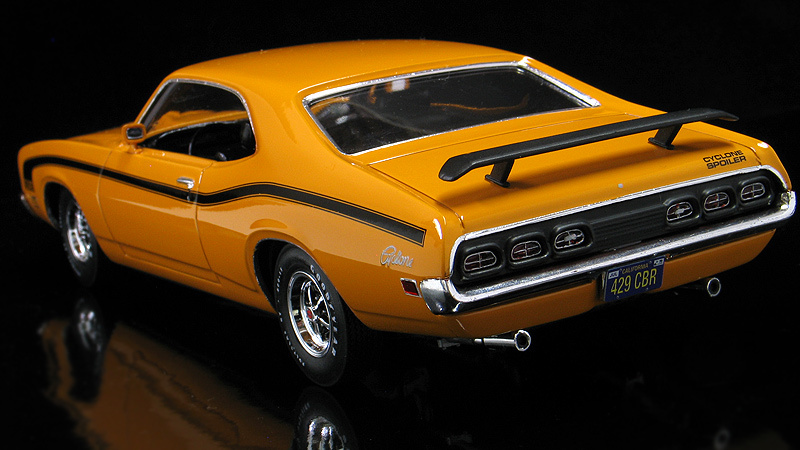 The Cyclone Spoiler was also available with a factory front spoiler, but a correct version of that part was never included in any of the kit versions. I built one from scratch out of sheet plastic and bondo. 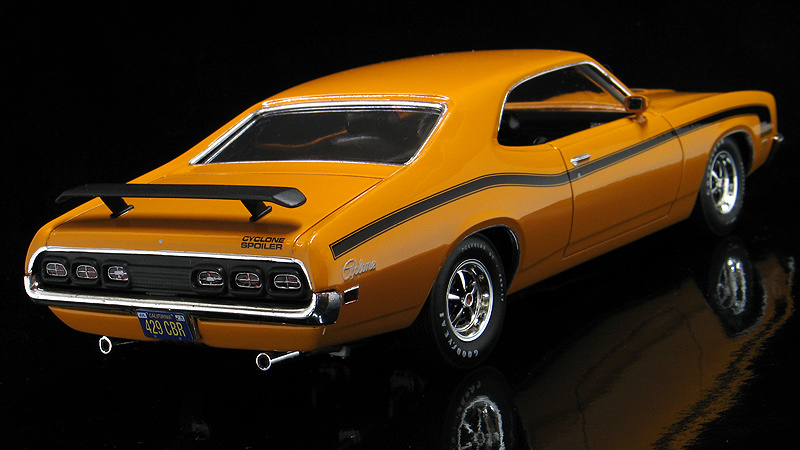 The wheels, tires and side mirrors also came from the Revell Torino kit.